The Dalai Lama is the spiritual leader of the Tibetan people. A beacon of inspiration for both Buddhists and non-Buddhists, he has persistently reached out across religious lines and to political leaders and scientists in dialogues advancing peace and understanding. For sixty years, he was the political leader of the Tibetan people, and in 1989 he was awarded the Nobel Peace Prize for his efforts to secure a peaceful resolution to the Chinese occupation of his homeland. 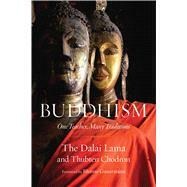 Venerable Thubten Chodron, born 1950, has been a Buddhist nun since 1977. A native of Los Angeles and a graduate of UCLA, she is the founder and abbess of Sravasti Abbey in eastern Washington State. She is a popular speaker for her practical explanations of how to apply Buddhist teachings in daily life, and she is the author of several bestselling books, including Buddhism for Beginners. She lives in Newport, WA.